Welcome to the Checklist for the Educated Horse Owner! Whether you have lots of experience with horses or are just getting started, there are some basic topics of horse care that every horse owner must attend to. Because we have removed horses from their original environments by domesticating them, we have to pay great attention to their living conditions. For our horses to stay happy and healthy, we have to provide conditions that are as close to their natural environment as possible, while still maintaining an acceptable level of convenience for ourselves. It’s really not as hard as you might think. Let’s dive in! Daily turnout as much as possible and regular riding. Ride your horse 3 to 4 times per week, and offer him or her turnout for a minimum of 1 hour per day (longer if less riding).In the wild, horses travel up to 25 miles a day, and spend most of the day walking and moving. 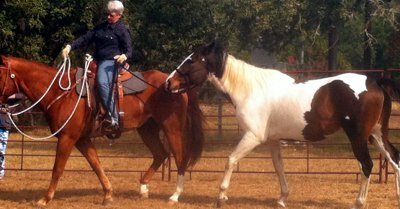 Exercise is crucial for keeping domesticated horses fit and ready for action. They need exercise to develop their cardiovascular and muscular systems, keep their metabolisms active, and stimulate their hooves. Moderate exercise decreases the chance for injury or soreness, and improves emotional health. As much grass and hay as possible! Ideally not more than 1 full flake of alfalfa daily. Offer as much roughage (hay and grass) as possible supplemented by Super Blue Green Algae. Feed grain only when absolutely necessary. Remember that horses are grazers! They should get most of their calories from roughage such as hay or grass. Offer as much hay as your horse wants to eat (unless they have a tendency to be overweight). Feed only grain and concentrates as supplementary calories for heavy exercisers or to keep weight on thin horses. If you feed your horse vitamin or mineral supplements, you can mix them in with a very small amount of grain (1 cup) daily. Not all hay is created equal. Some kinds of hay, depending on the soil, are going to be more nutritious than others. For instance, alfalfa tends to have higher levels of vitamins, minerals and protein than grass hay (most grass hay is grown in soil that doesn’t have a wide range of minerals). If you feed your horse on a mostly hay diet, you’ll need to offer additional nutritional supplementation. Super Blue Green Algae covers almost all of a horse’s nutritional needs. Feed daily with a small amount of grain. For horses that tend to get overweight, even on a straight hay diet, adding a small amount of oil to their hay or feed can curb their appetites and affect their metabolisms so they don’t feel so hungry all the time. If you’re not able to feed a lot of hay to an overweight horse, make sure to supplement their vitamin and mineral needs by feeding Super Blue Green Algae in flax meal or rice bran mashes. Avoid manure and urine, pack with mud. Keep stalls clean of manure and urine, allow clean mud from pasture to stay packed in hooves. These guidelines apply whether your horse is shod or barefoot. Pick your horse’s feet out when you turn him or her out to pasture (gets rid of manure and urine in the hooves). Overfill your water trough over to create mud, and leave any mud from the pasture packed into hooves for support and as an insulator against manure and urine.There are a lot of issues surrounding hoofcare, but generally if you keep your horse’s hooves in a natural condition, they should be fine. This means cleaning stalls often and leaving mud packed in hooves. Mud helps support the hoof structure and provides hoof stimulation. Check your horse’s feet for sticks and rocks before riding, but don’t get too fanatic about cleaning them out unless they are packed with manure. Take your horse to an equine dental specialist. Regular floats with an equine dentist every 6 months to 1 year are a must! Horses need their teeth maintained on a regular basis for healthy chewing, weight maintenance, and digestion. When floating teeth, it’s better to do more frequent floats and do less each time. Excessive floating all at once isn’t useful.Use an equine dental specialists who uses the right tools (many different kinds of floats and minimal power tools), uses minimum drugs and restraint, and uses a speculum. They should float the whole mouth, not just the teeth in front, and allow the horse to close and rest his mouth every few minutes. Visit several dentists or vets and see how they float before making an appointment for your horse. Poor floating or lack of floating can lead to weight loss and performance issues such as head tossing, rearing, bucking, pr sensitivity in the poll. Use the minimum number of vaccinations possible. Your horse’s vaccination program should be tailored to age, health, amount of travel, and risk. Most older horses have been exposed to other horses and don’t need to be vaccinated for diseases like influenza or rhinopneumonitis. If you’re going to vaccinate for influenza, consider using the intra-nasal form, which has been shown to be much more effective.Focus on vaccinating for potentially fatal diseases, such as encephalitis, tetanus, and rabies. Vaccinate only healthy horses that have no chronic disease symptoms. Focus on strengthening the overall immune system with diet, exercise, nutrition, and emotional health. Know basic first aid and call a vet for emergencies. Increase your powers of observation so you can report accurately to your vet. Knowing how to help your horse in a first aid situation means knowing what’s normal for horses. This includes temperature (99-100 degrees), pulse (36-40 beats per minute), and respiration (8-12 breaths per minute). You will also need to be able to evaluate the color of the gums (they should be pink, not gray or red), and capillary refill time (less than 1 second). Learn to stop major bleeding with a pressure bandage and keep basic shock remedies on hand.In addition, increase your powers of observation. Learn what’s normal in terms of behavior and appearance for your horse. When you’re not sure, err on the side of caution and let your vet decide whether you can handle the situation by yourself. The more you learn and practice, the more confident you will become in first aid situations. Pick the right horse for the job. Learn more about Chinese five element guidelines to help you pick the horse with a personality suited to your goals. A 3 year-old thoroughbred isn’t a good choice for a child’s horse just as a draft horse does not have the right temperament for barrel racing. To keep both you and your horse happy and content, you need to choose a horse with the right personality for what you want to do.The Chinese five element guidelines can help you assess a horse’s personality before you buy. These guidelines sort horses into five categories, defining their personalities, behavior tendencies, strong points and weak points. Certain elements are naturally more suited to certain disciplines. Check the link at the end of this article for Chinese five element resources. Breed your horse only if you have a very specific program in mind. With so many horses out there to choose from, it’s often much easier to simply buy the horse you want than to try to breed for one. Unless you have a very specific program and purpose in mind, and you understand all the potential pitfalls in a breeding program, breeding can be a long and difficult journey.If you do want to breed your horse, study the process thoroughly. Figure out how much it’s going to cost in terms of stud fees, mare care, cost of foaling out, and training your horse to the right age (where you can compete or sell your horse). Are you willing to pay that much to breed your horse? If not, buy one. Pair up with someone who has experience in these areas. Because trailering and showing can be stressful for you and your horse, it’s best to draw on the experience and wisdom of someone who has done lots of it. Get together with an experienced trainer or friend. They can help you load and trailer your horse, and take them to new places or shows. There’s no substitute for experience, and your friend or trainer will know a lot of tips for reducing stress and making the process more enjoyable for both you and your horse. Alternative healthcare options are useful for healing physical or emotional discomfort. There’s a whole world of healing out there, and much of it is worth exploring. If your horse is suffering from physical or emotional discomfort, you might consider using alternative options such as animal communication, flower essences, chiropractic, acupuncture, or homeopathy to work with these issues. You’ll be surprised how smoothly problems can be resolved when you work with a skilled holistic equine veterinarian or holistic practitioner.